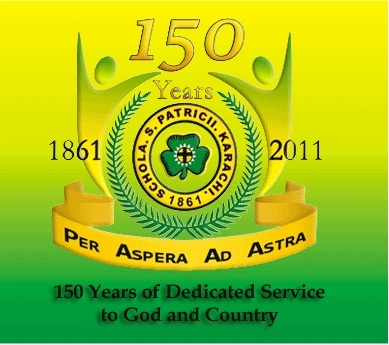 Per Aspera Ad Astra - "Through adversity to the stars"
The School has marked its 150th year on 6th May 2011. A series of academic & curricular activities are taking place right from the Primary Section through out the whole school to the Secondary, O & A Level Sections. Plans for upgrading the Main Auditorium and the Basketball court along with a mini Gymnasium are in the pipeline. St. Patrick’s was established on May 6, 1861, and officially registered as a high School in 1867. Its founder was Rev. J.A. Willy of the Society of Jesus (the Jesuits), who controlled the school till 4 June 1935. It was then taken over by the Franciscan order from 5 June 1935 till 6 October 1950. Since 1950 it has had Pakistani Principals belonging to the Roman Catholic Archdiocese of Karachi. The school is a multidimensional organization with a number of parallel streams of education. These streams include the technical stream comprising of polytechnic education and the Matriculation stream in which students sit for the Karachi Board Examinations. The remaining two streams are the ‘O’ and ‘A’ level streams where students sit for the Cambridge International Examinations (UCLES). This stream is highly selective and comprises of compulsory and optional subjects, which include Mathematics, Additional Mathematics, Biology, Chemistry, Physics, Principles of Accounting, Economics, Business Studies, Pakistan Studies, English language & Literature, Computer Studies Statistics and Environmental Management. School facilities include separate libraries for all sections, Laboratories, including fully equipped Computer labs, sporting fields, auditoriums, scouting and college counseling. The school has produced well known leaders and personalities, these include two Cardinals of the Catholic Church, two Prime Ministers of Pakistan, two Chief Ministers of Sindh, (The leader of the BJP party in India is also a Patrician), mayors of Karachi and well known people in nearly every field. The school also boasts of an excellent tradition in sports, particularly the cricket and hockey teams which have consistently ranked among the top five high school teams in the state. The school has also produced a number of leading sportsmen who have gone on to play at the highest level for Pakistan, like Danesh Kaneria. The school is owned by the Roman Catholic Church and managed by the Catholic Board of Education in Pakistan. The current Principal is Rev. Fr. Joseph Paul, the vice Principal is Rev Fr Norbert Mendonca & the headmaster of the O'Level section is Mr. Benny Vaz. (Copyright) St. Patrick's High School.